Remember when it snowed? Seems like ages ago. Now that the slush is all melted and the temps are back in the 70s, or the 50s, or whatever, I thought I'd offer a few observations on winter gardening in Austin. Austin's climate sits at the intersection of dry desert and wet tropics, a climactic split personality that produces long summers, mild winters, and exceedingly short springs and falls. If the summer here is an oppressive, one-note slog, winter here is deceptively fickle. Most days are pretty nice. We get long stretches of beautiful weather and then bam! — the temperature plunges. My theory is that the sporadic nature of freezes in Austin makes them seem more seldom than they actually are -- it's easy to forget that last winter, a notoriously warm one, included a dip to 19°F on the morning of January 7. The PHZM represents the average lowest temperature over a thirty year period and assigns a number to different “Hardiness Zones” around the country. Plants and seeds are marketed with corresponding zone numbers so that farmers and gardeners can determine which plants will survive their winters. Note that the data stops in 2005, so it doesn’t reflect the past twelve years of global warming. Dips into the teens are not unusual for us. According to the USDA Plant Hardiness Zone Map (PHZM), Austin’s “average annual extreme minimum temperature” is between 15-20 degrees, putting us in Zone 8b, on par with Seattle, Portland, and Savannah. Of course our climate in general is very unlike those cities; the PHZM only takes into account extreme low temperatures, not highs or precipitation. Still, it’s pretty interesting to examine the chart and compare what a “mild winter” may mean to different people around the country. While my friends in New York City (7a/7b) roll their eyes at our pathetic excuse for snow, another friend who just moved back here from San Francisco (10a/10b) was shocked at the cold last week. And of course Yoopers from sections of Michigan’s Upper Peninsula (4a) will consider 19°F downright balmy for January. It’s all relative. My point here is that, while Austin’s winters are mild on average, the temperature fluctuations tend toward the extreme. Fifty-degree drops, like we had between Monday and Friday last week, do tend to happen here, which is hard on both gardeners on plants. I find it cognitively very difficult to think about cold-front preparation when it's 75 degrees and sunny, so the night before a freeze is always a last minute scramble in the dark. On Thursday night, when two people texted me to ask whether or not they should bring their potted plants inside in advance of the freeze, I was dashing in and out of the wintry mix doing that very thing. Dramatic temperature fluctuations are actually harder on plants than sustained cold. 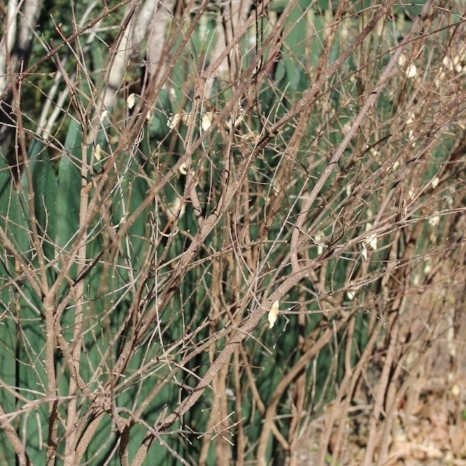 Plants’ natural defense mechanisms for surviving winter are disrupted by extreme swings. To simplify it a bit, cold weather signals a plant to stop growing above ground, and to redirect energy into its roots; this is normal winter dormancy. In spring, things warm back up, the plant comes out of dormancy, and top growth resumes. But when it's 85° on Monday, 31° on Friday, and 70° again the following Monday, plants get into a wonky stop-start pattern that increases the likelihood of cold damage: warmth tricks them into producing tender new foliage that will be easily frostbitten. Anecdotally, I observed more frost damage from January 2017’s sudden plummet from the 80s to the teens than I had in the previous winter, which generally cooler but had fewer extreme fluctuations. This Barbados cherry (Malpighia glabra), usually evergreen here, lost its leaves in January's cold snap. It fully recovered by mid-summer. Scrape test: the green tissue beneath the stem tells you this stem is still alive! Container gardening brings special winter challenges as well. Plants in pots are more susceptible to frost damage than ones in the ground because they lack the natural insulation of the earth. I’ve heard people describe the difference in cold tolerance between container plants and in-ground plants as about ten degrees, or one zone on the PHZM. That’s the difference between north Dallas (8a) and south San Antonio (9a) — nothing to sneeze at. ...And here's how it fared last week's storm. I covered it on Thursday, and on Friday morning it looked fine, but by Sunday it had succumbed the shock of the freeze. The plant is still alive, though. (To determine this, I scraped a tiny piece of the stem; the underlying tissue layer is still green, which means the top of the plant is not dead.) I presume my Mussaenda will make a complete recovery if I don’t subject it to any more freezing nights. Ideally I’ll bring it in every time we get a freeze warning. If I forget to bring it inside and it starts looking worse, I’ll cut it back to the base of the plant, put some mulch over it, and hope for the best. Remember that just because the plant appears dead on top, it may still be alive underground. Sometimes the best course of action is just waiting! So what can you do right now, while we’re having gorgeous weather, to protect your plants from future freezes? First, you can get to know the hardiness ratings of your plants. This will not only help you decide not only what to bring inside and what to cover during the next freeze, but also what not to worry about. I used to expend a lot of effort covering all my outdoor pots with frost cloth every time it got cold, then I got lazy and observed that a lot of plants do just fine without it. Now I group the pots that need covering in a cluster during the winter months, and leave the rest alone. Another idea is to make a winter home for your most sensitive plants, especially the cute little tender succulents (the aloes, crassulas, kalanchoes, echeverias, sanseverias, etc) that will absolutely perish if left outside. If you don’t have the luxury of a greenhouse, you can improvise. I have a dearth of direct sun in my apartment; my only southern exposure is a frosted glass window in an awkwardly tall stairwell. So I added shelves to the window and stuck my succulents up there. In March, they’ll come back outside to bask in our long, hot summer. The next time a freeze looms, I’ll post some more detailed suggestions for plant-protection tips. For now I’m going outside to enjoy this bright and gorgeous December day! On Sundays, I will try to help someone solve a problem with a sad plant. Indoor and outdoor plant submissions are welcome. To submit to #SadPlantSunday, send me a photo of your plant and a description of the situation. You can direct message @deltadawngardens on Instagram, post on Delta Dawn Gardens' Facebook, or email leah@deltadawngardens.com. This week I'm dispensing with the Q&A format and taking a little philosophical detour. My plan, at the start, was to showcase an ailing specimen from my own garden: a shade perennial beset by an infestation of what I assumed to be mealybugs (pictured below). I intended to diagnose the problem with the plant, identify the insect and throw out some fun facts, and explain what steps I took to try to save the plant. I was going to conclude by saying, Hey. See? No big deal. Everybody has plant problems. THERE’S NO SHAME IN HAVING A SAD PLANT. But that’s not what happened. Instead I went down a Google rabbit hole of research and came out the other side feeling frustrated and a little ashamed of my sad plant, because I still haven’t been able to diagnose what, exactly, is ailing it. I am going to save it for next week and instead write about the very personal subject of plant shame. Nature is really a goddamn enigma. In the immortal words of Donald Rumsfeld, there are known knowns, there are known unknowns, and then there are unknown unknowns, and it is the preponderance of the latter in the world of plants that really thwarts people. So I will not blithely say there’s no shame in having a sad plant, because it’s not that simple. Sad plants shouldn’t be a source of shame, but they often are. My once-beautiful black bromeliad, an impulse buy I immediately regretted. You know that feeling when you see a gorgeous plant you just WANTWANTWANT and you buy it and take it home, and six weeks later you’re putting it in the trash, realizing that the worst thing that ever happened to that plant is YOU? Or maybe you don't throw it away, but try to wish it back to health, and it keeps shrinking and suffering and turning brown, and you hate the sight of it but you keep it around out of a mix of guilt and self-flagellation because, on some level, it is just reassuring to be reminded of your failings? Plant shame is real. Black thumb. Brown thumb. Purple thumb. When our plants fare poorly, we almost always blame ourselves. "I even kill cacti!" is something I hear a lot from people who think they are incapable of keeping plants, even though cacti are actually among the more difficult plants to domesticate. Think of the hot and arid environments most favorable to cactus life — utterly inhospitable to humans! And yet we bring cacti into our living rooms expecting them to thrive, and get upset with ourselves when they don’t. Have you ever met a self-described “green thumb?” I’ve befriended a boatload of gardeners, growers, horticulturists, and landscape designers and I can’t recall ever encountering one. It’s not something people say about themselves, but rather something people say about others by way of putting themselves down. “My sister got the green thumb in our family,” my Mom says. I keep trying to tell her that the whole “green thumb” concept is a myth, and she says, “Well, that’s easy for you to say. You have a green thumb.” It becomes a self-fulfilling prophecy. One of her plants died because her Great Pyrenees sat on it, and somehow she even blames herself for that. One of the best gardeners I know suffers from acute plant shame. I go to her amazing house and she’s like, “Oh god, I’m mortified by how horrible the garden looks!” And I’m looking around thinking it looks like a fabulous botanical wonderland, and almost exactly the same as the last time I saw it. Daily exposure to her beautiful garden causes her to become blind to its charms; all she can see is armadillo damage. Another friend has a particular gift for houseplants but always dismisses my amazement, like “Oh, this old thing?” She’ll stand in her home filled with florescent tropical blooms and tell me about the time five years ago that one of her plants died. Good gardeners invariably downplay the difficulty of gardening, which makes them dangerous people to be around. They will tell you that, for instance, bromeliads are the easiest thing in the world. They are not. I made the mistake of buying an enormous one after seeing the bromeliad collection of the gardener mentioned two paragraphs ago. This plant, now a wilting, crusty shell of its former self, is like a talisman of shame that I keep around to torture myself. Every time I see it, I think, "And that is why I can't have nice things." Gardening is a humbling activity. Humans can only control so much. This explains why fruit and vegetable gardeners seem like very pessimistic people, perpetually fretting that it’ll be too cold for tomatoes or not cold enough for peaches, and yelling crotchety curses at nematodes and vine borers and squirrels. On the other hand, these are also the people who save seeds to trade with their seed-saving friends and research crazy heirloom varieties. They may get more pleasure out of planning their gardens than they do from the finished product. Anticipatory joy — if that’s not optimism, what is? By the time the veggies are ripe they’re already thinking about next season. Why does garden humility so easily morph into shame? I think it must have something to do with the alienness of plants and our clumsy attempts to relate to them. They are alive, but they aren’t sentient. They don’t have personalities like our pets do. They’re different enough that trying to anthropomorphize them just gets awkward. It's difficult to imbue them with a sense of "being," and much easier to view our plants as extensions of ourselves, mirrors of our personal virtues and, more often, vices. Back to the sad plant I was intending to write about. It is a Uruguayan firecracker plant (Dicliptera suberecta) that has been languishing on my balcony for the better part of a year. I don’t remember when I bought it, but I do remember where: the shade perennial section of a local nursery that sells a lot of interesting plants in the small 4” pot size. The nursery’s info card said the plant was a hummingbird magnet that would do best in morning sun. Being that most hummingbird-attracting plants do not grow in the shade, and that morning sun is all I have due to my northern exposure, I gave it a try. I planted it in a spot that gets about 15 minutes of morning sun, which is evidently not enough. When it failed to bloom, I failed to water it. It grew lanky; I grew resentful. I neglected this plant so thoroughly that I actually forgot the name until I decided to write about it, and spent several hours asking around and googling "Diphtheria" before finally figuring it out. The known known: There is something wrong with my plant. The known unknowns: A bug is eating my plant but I don’t know what kind. The unknown unknown: how to identify an insect. My reference books were no help. Google only confused me. I took a sample to the County Extension Office. The entomologist who examined my specimen told me it’s not a mealybug, it’s a type of hard scale, and that in order to identify it down to the species level she would have to mail it to a specialist out of state. I thought I knew what mealybugs were, I thought identifying a bug would be a simple affair. Now I know I knew less than I thought I knew. What is this bug? I’ll cover that saga next week. In the meantime, I’m going to put that sad bromeliad in the compost pile and let go of the shame. There's always next season. Each Sunday, I will try to help someone solve a problem with a sad plant. Indoor and outdoor plant submissions are welcome. To submit to #SadPlantSunday, send me a photo of your plant and a description of the situation. You can direct message @deltadawngardens on Instagram, post on Delta Dawn Gardens' Facebook, or email leah@deltadawngardens.com. We have a yucca in a pot by our front door that may be dying. It has some sort of bug infestation. The leaves have spots and are turning yellow. It has been in this pot for at least five years. This location gets a lot of afternoon sun because the porch faces south. What should I do? Are the bugs killing the plant? Ok, full disclosure, this was a question posed to me by a client this week and not an actual submission to #SadPlantSunday. (I did not receive any submissions last week. Patiently awaiting your plants' tale of woe.) In any case, this softleaf yucca (Yucca recurvifolia) is a good Sad Plant example because it brings us to the subject of our oft-maligned invertebrate friends, the insects. Let's take a look at this bug. Excuse the blur. This guy was small and fast. 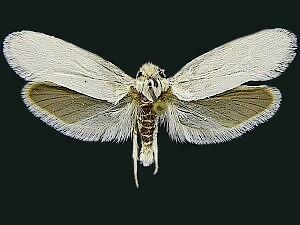 Now that you have identified your bug, you should go to Home Depot and stock up on pesticides. JUST KIDDING! Please don't do that. Pesticides/Insecticides are rarely necessary in the garden and frequently make plant problems worse by destroying "good" and "bad" insects indiscriminately -- killing off both pests and the beneficial insect species that naturally keep pest species in check. The majority are toxic, expensive, sold in greater quantities than you'd ever use, and again, straight-up unnecessary. There are some organic/non-toxic options (neem oil, dormant oil, diatomaceous earth, insecticidal soap) that are useful in fruit and vegetable growing, but I rarely use them on ornamentals. Plants are pretty good at defending themselves when they're healthy. As long as they have good soil, room to grow, and the right amount of air and water, bugs and diseases aren't usually a problem. Unhealthy plants become susceptible to diseases and predation. In other words -- and get ready, because this is deep -- this yucca isn't sad because it has bugs, it has bugs because it is sad. Insecticides won't cure the "root" sadness, because the real source of the trouble is beneath the soil. We must plumb the depths. Because the plant hasn't been repotted in five years or more, we can be fairly certain this yucca is pot-bound. Indeed, when removed from the pot, its roots are circling and filling the pot as it struggles to survive in a too-small space. The root ball is a dense cluster of rhizomes (fleshy, potato-like roots) and dead, desiccated root fibers, which indicate that the plant has been in this pot for too long. Another thing I notice after shaking the root ball loose: the soil in the pot does not appear to be potting soil. It seems like a mixture of topsoil and sand. That would be an OK planting medium for a yucca in the ground, but container plants need special, fluffy soil in order to promote air circulation and prevent soil compaction. Packaged potting soil usually contains perlite (lightweight flecks of extremely porous volcanic glass) as a soil-fluffing ingredient. There is no perlite or fluffing agent here, and much of the soil is very dry bone-dry and compacted. The last photo above shows a close-up of healthy white root fibers. Signs of life! This plant can likely be restored to health by eliminating all the Yucca Plant Bugs and repotting in a larger container with good-quality potting soil. Most of the bugs dispersed when I took the plant out of its pot. But to be extra sanitary, I will trim back the dead leaves on the stalk and wipe off the living leaves with my gloves. This should take care of any eggs. A hard freeze this winter will finish the job. One special note about repotting yuccas, agaves, aloes, succulents, and cacti: they require a little rest ("hardening off") before going to their new home. As desert natives, these plants store lots of water in their stems and roots, and the inevitable cuts and tears that occur during transplanting can invite fungal problems if the plant is immediately put into soil. Giving plant a few days of fresh air will allow any wounds to callous over, and from these calluses new roots will grow. These plants can live for weeks or even months out of the ground! After a 3-4 days hanging out on the patio, the yucca is ready to repot. It will spend a period of convalescence in the "plant hospital" on my patio. (I borrowed the concept of the plant hospital from a nursery I used to work for. Side yards and other rarely-viewed spaces make good locations. During winter I utilize the dead space next to my A/C unit for rejuvenating sad plants.) In its new, larger pot, filled with my favorite succulent potting soil (Thunderhead Cactus mix from Geo Growers) and a dash of granular organic fertilizer, this yucca has a great chance of survival. New growth will come from the top of the plant; the damaged leaves will not recover. So I've removed the bottom layer of foliage. Some leaves should stay on so that the plant can photosynthesize. The sad plant in the plant hospital. In six months I expect the yucca will be back in condition for prominent display at my client's house; in the meantime, I potted up a red yucca (Hesperaloe parviflora) to prettify her entryway. Softleaf yuccas can get quite large (six feet or more in these parts) so I'd like to put this one in the ground next fall and see if we can get it to bloom. A yucca in bloom, with its gorgeous spray of teardrop-shaped flowers, always stops me in my tracks. My drawing of a native Texas yucca, Yucca pallida. Which brings us back to the subject of our insect friends. Yuccas rely on a specific species, the Yucca Moth, (Tegeticulla yuccasella) for pollination, while the moth relies on the yucca for food. Coevolving for tens of millions of years, each depends on the other for survival. This special symbiotic relationship is just one tiny dot of color in the grand picture of nature's web of life -- and a beautiful reason to ditch the insecticides. I'll post some photos of the plant's progress a bit later. Each Sunday, I will try to help someone solve a plant problem with a sad plant. It's #SadPlantSunday! This week's Sad Plant is a houseplant, but submissions for outdoor plants are welcome too. To submit to #SadPlantSunday, send me a photo of your plant and a description of the situation. Send a direct message on Instagram, post on Delta Dawn Gardens' Facebook, or email leah@deltadawngardens.com. Yes, I believe you can save this plant! The drooping, yellow, spotted leaves on your corn plant (Draceana fragrans) are likely an indication that there’s too much moisture down below — I suspect we will find the root of the problem (ahem) in the soil. Starting at the base of the plant, take look at the canes. Do you see indentions, discoloration, or bruising? Does the cane feel firm, or soft and mushy? These would be signs of stem rot. Next, pop the plant out of its pot to inspect at the root ball. (*To do this, lay the pot on its side, roll it around a bit, and let gravity loosen the root ball. If it won’t dislodge, take a butter knife around the pot’s inner edge. Guide the plant out, but don't yank it.) Is the bottom of the pot soggy? That’s an indication of a drainage problem. Take the rocks out of the pot and make sure that the drainage hole isn’t blocked. Even if you haven’t been overwatering the plant, a lack of drainage can cause root rot. Now gently loosen the soil around the roots. Are they white and fleshy, or brown and mushy? Do you notice a smell? Stank and/or sliminess are sure signs of rot. But if you think the roots are rotted, it’s time to do a bit of surgery. There are several ways to re-root a Draceana. I’m going to suggest three techniques and ask you to do them all. One of these methods is likely to work, and if you’re lucky, all three will be successful experiments, and you’ll be rewarded with lots of clone babies of your original plant! Technique 1: Take a cutting and root it in water. Chop the top 6-8" off the big cane, remove all but one or two leaves, and stick the cane in a vase filled 1/3 with water. Change the water weekly to prevent bacterial buildup. A wine bottle, tinted vase or opaque vase would be ideal so that the roots don't get too much light. A clear vase will be fine if you keep it out of direct light. This YouTube video gives extremely detailed instructions, but if you prefer short and sweet, I'm feeling pretty inspired by this guy. 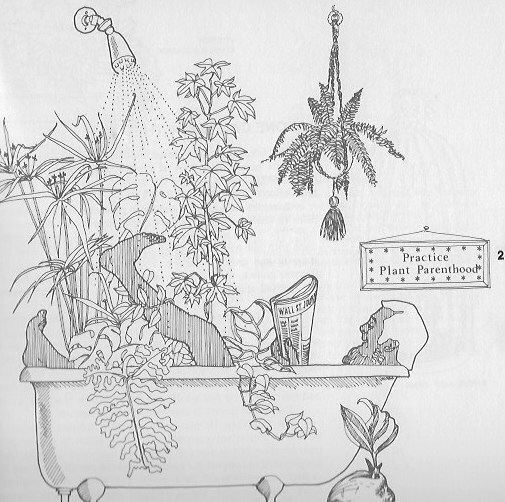 Image from The Time-Life Encyclopedia of Gardening: Foliage House Plants, 1972. 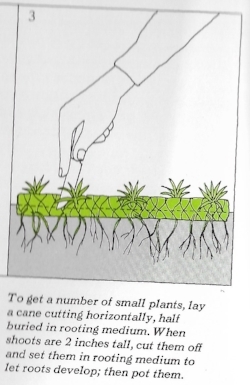 Technique 2: Take a cutting from the healthy tissue in the middle of each cane. If you can, cut at an angle, half an inch or so above a bud. (Buds look like little brown or white nubbins on the cane. That is where the new growth will come from.) Cut the bottom of the cane flat, and dab with rooting hormone. Replace the soil in your current pot and stick this cane in there. If you have wood glue, you can paint it on the cut to seal the "wound" you just created, but this is not crucial. (The black paint you see on the tops of your cane is a sealant used when it was propagated.) Keep the soil slightly damp, but not too wet, by giving it occasional water. New growth will begin on top, like so, while the roots will grow below. Technique 3: Take another cutting from the healthy middle tissue, and put some potting soil in a second pot. Dampen and brush one edge of the cane with rooting hormone, and lay it down horizontally in a potting soil. Later, you can slice these into pieces and let each be its own plant. Again, keep the soil moist. This is how corn plants are propagated. ... Now you wait. Re-rooting can take 1-3 months. Check back with me in 6-8 weeks to tell me your progress - let’s say New Year’s Day, shall we? Finally, a few thoughts on watering. Benign neglect is the key to success with many houseplants. Overwatering is loving them to death. The best course of action is to water deeply, but infrequently, and ask the plant if it really needs water via the finger test. Stick your finger in the soil, and if the top two inches feel dry, it’s time to water. This video provides a good quick demo. You can put the plant in the shower give it a good soak from time to time— you won’t hurt the plant, as long as it’s ready to be watered again. During the dry winter months, you may even consider relocating your plants to the bathroom to give them a little humidity boost. I promise they won't mind!